Names are listed in art nouveau style lettering by Archibald Knox, on two plaques of red sandstone and Manx rough stone. 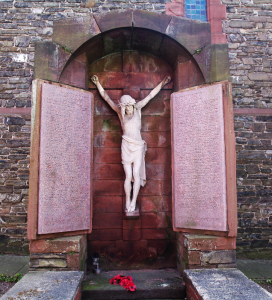 Each plaque is mounted either side of a crucifix which is made out of white sandstone. The sculptor of the crucifix was Harry Emms of Exeter. The memorial was unveiled on 28th July 1921 by Lieutenant Governor Major General Sir W. Fry. It was dedicated by Reverend H.S. Taggart on 28th July 1921. The memorial was sponsored by private donation from the congregation of St Matthew’s Church. The memorial was built by Thos Quayle, a stonemason of Douglas. Memorial designed by Archibald Knox. In 1994, the memorial was renovated in granite, due to the excessive weathering of the original sandstone. Fuding for the refurbishment was partly provided by the Douglas Development Partnership, as part of the Douglas 2000 initiative. The new memorial was designed by the architect Ashley Pettit and the work completed by David Gregg of Gregg memorials. Courtesy of Man xNational Heritage via the link at imuseum.im.